BURNABY — In the midst of flipping the script against the No. 1-ranked team in all of NCAA Div. 2 basketball on Saturday night, one thought kept running through Jessica Jones’ mind. 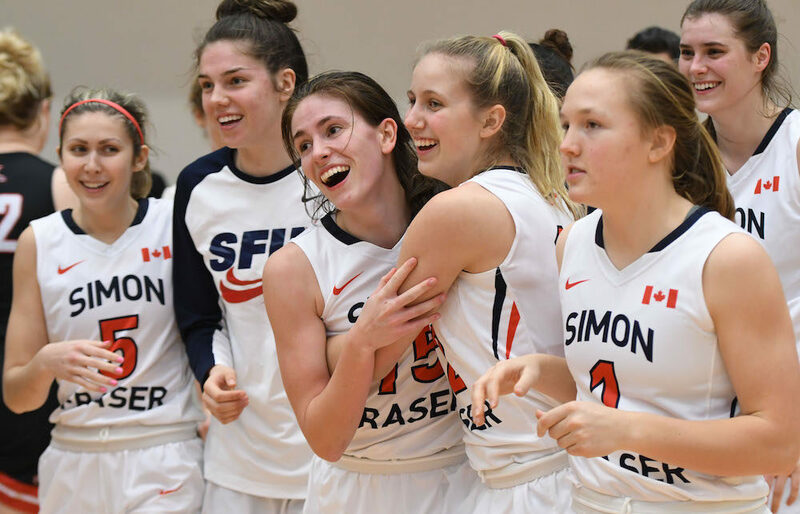 And so by the time Clan forward Sam Beauchamp scored on a lay-up with 4:02 remaining, a young, unranked Simon Fraser Clan team had taken a 71-63 lead over the No. 1-ranked, veteran-laden Northwest Nazarene Nighthawks. That set the stage for one of the biggest shots in program history. 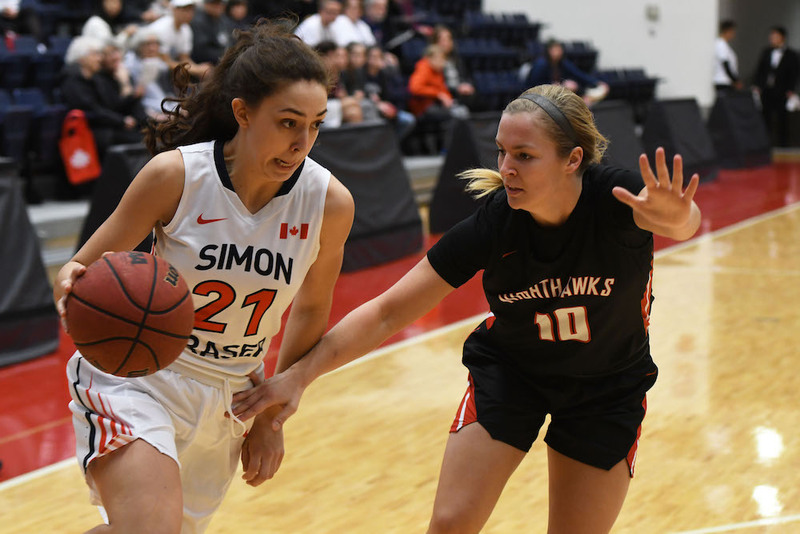 SFU point guard Tayler Drynan, under considerable duress, drove the opposition baseline and fed teammate Kendal Sands, whose high-arcing three-point shot fell through the basket with 18.4 seconds remaining to snap a tie and ultimately give the Clan (7-3) a 76-73 win over the Nighthawks (9-1) in front of a sell-out West Gym crowd. Just where the win ranks in the all-time history of Clan women’s basketball is up for discussion, but in any debate you have, it’s in the running for both its significance and its drama. THEY GOT A BASKETBALL JONES! Bruce Langford can dish dry humour with the best of them, yet there was no mistaking the pride in his voice as he outlined what he told his team they had to do if they were to walk out on the court at the start of the fourth quarter Saturday with a chance to win the game. “We told them that they had to be down by 12 at the half because if we were, they wouldn’t be worried about us,” Langford explained later. “But we were only down by eight (44-36). I told my players that I was disappointed in them and that we’d let ourselves down. One of the most powerful things to witness in all of sport is a run of points in the game of basketball because it’s a truly organic process. And on Saturday, before you knew it, it had happened in the grandest of fashions for Simon Fraser. 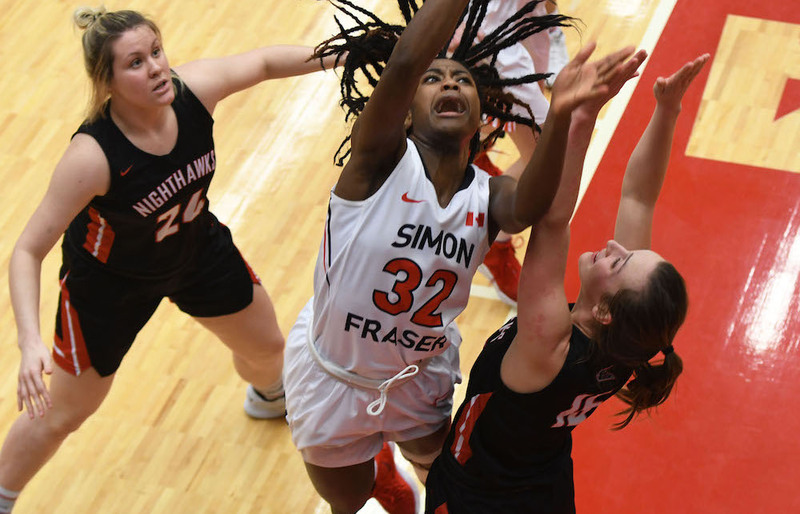 Trailing 63-55 about 90 seconds into the fourth quarter, SFU’s sophomore guard Jessica Jones did what she does best, rising off the court and dropping a three-point bucket. Jones then stole the ball from Northwest Nazarene’s McKenna Walker and sped unimpeded to the rim for a lay-up, narrowing the gap to 63-60. 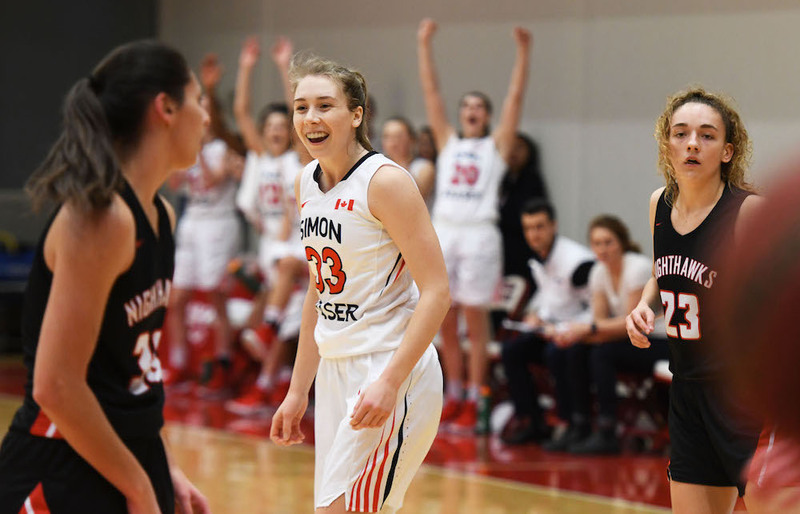 Clan senior forward Sophie Swant hit a free throw, then Jones dropped another triple, and with 7:40 left, SFU had its first lead of the game at 64-63. 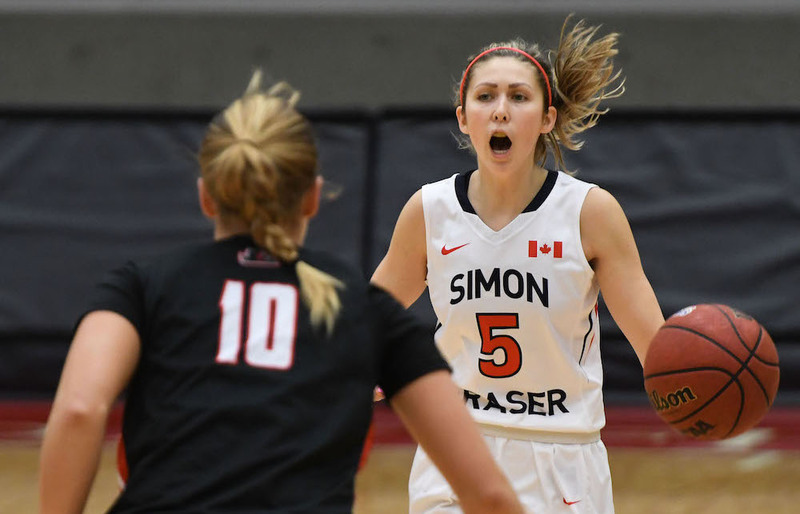 Over the next 56 seconds, a veteran Nazarene squad, one which had carried both a nine-game conference win streak and a perfect 17-0 record on the campaign to the top of Burnaby Mountain, showed its first signs of panic. To quell upstart Simon’s ambitious surge, the Nighthawks pushed tempo and began looking for quick strikes. But when they missed on a three, and then were denied on three straight lay-up attempts, SFU took full advantage. Jones stepped inside the arc to hit an 18-footer, and Swant hit a triple of her own off a Jones’ offensive rebound. Two more Northwest Nazarene missed three-point shots preceded Beauchamp’s lay-in, and when the dust had settled, an SFU team which on Saturday played five pure freshman and four sophomores in its 12-player rotation, completed a breathtaking 16-0 run over a 5:17 span of game clock, one which featured eight consecutive stops, the most that any team in Langford’s 18-season tenure atop the hill has ever managed. Jones, who had buried a three at the very start of the fourth, scored 14 of her game-high 20 points in the final frame. An opposition coach or a true basketball fan? It doesn’t matter which. If you respect the game, and what matters most about it, then you have to love the Northwest Nazarene Nighthawks. They are a team whose leading scorer, Avery Albrecht, averages just 12.9 points per game. But they’re also a team whose top 10 players all score within 6.7 points-per-game of each other. You don’t have to look very hard to know that such balance is darn near impossible to find. Their 87.8 points-per-game team average isn’t gaudy, yet their 23.7 point average margin of victory is stunning. And the Nighthawks entered Saturday’s game No. 1 in the D2SIDA poll, and No. 3 in the WBCA poll. With all of that to contend with, the Clan just knew their fifth straight GNAC win wasn’t going to come without their plus-plus effort of the season. Steady progress has been the theme the entire season, and Drynan remembers well how the groundwork was laid. 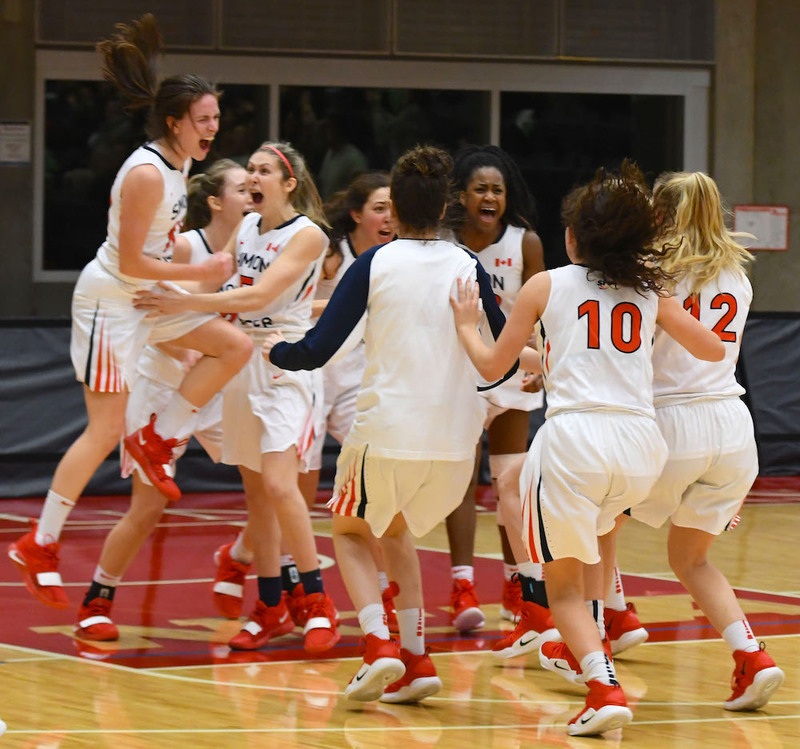 “We talked about it at the beginning of the season at a team retreat in Whistler,” said Drynan, the team’s lone American, who chose SFU after a star-studded career at Spokane’s Gonzaga Prep where she was part of the powerhouse senior varsity which won back-to-back Washington Quad-A state titles. The Clan’s core of four sophomores is a truly eclectic bunch. The all-B.C. class is actually comprised of just one pure second-year player in guard Kendal Sands, and three redshirt sophs in Claudia Hart, Jessica Jones and Ozi Nwabuko. Of that trio, only Nwabuko is an injury redshirt, sitting out all of last season with an ACL tear after being named the GNAC’s Freshman of the Year in 2016-17. And at the core of the Clan’s rise to prominence over the past few weeks, it’s been impossible to ignore the impact of Nwabuko, who upon her return, is looking like even more of game-changer than before her injury. The trench work, on a Clan team not very deep in front-court numbers, has dictated Nwabuko spend more time as a genuine post that ever before, and such responsibility does come with a physical toll. And Nwabuko was loving the fact that she, along with Beauchamp and Hart, have been able to provide the means to a more effective inside-out game on a team known for its archers. “Honestly, I think it’s great because that means I can kick out to the great three-point shooters we have on our team. Tonight Sophie hit some, Jones was on fire, Tayler, and Kendal hit some, too. In fact Swant (18 points, 11 rebounds), Drynan (12 points, five assists) and Jones each hit four treys on the game. The biggest basket, however, came with the team’s two point guards on the floor together, and it was a play that will rank among the most dramatic in team history. Langford had elected to put both Drynan and Sands together on the floor for the final 42 seconds of the contest, and paired with another shooter in Jones, and multi-talented threats in Swant and Nwabuko, the options, in a game deadlocked at 73-73, were plenty. Only Drynan and Sands, however, would touch the ball over the game’s defining possession. Drynan took the inbounds, played catch with Sands, then turned a corner at one end of the baseline. Very quickly, the Nighthawks brought trapping intent with a pair of players and it looked for a split second like Drynan was going to be forced out of bounds. However with Jones outside as a decoy, and Swant and Nwabuko doing just enough to relieve interior congestion, Drynan somehow managed to plant her right foot inbounds under the hoop and deliver a laser pass to Sands in the opposite baseline corner. With two seconds remaining on the shot clock and 18.4 seconds in the game, Sands cooly drained the winning shot. In the end, however, it was a reminder of why they play the game, and why the rest of us just love to watch.